"20 years from now you will regret more for what you did not do than for what you had done. That is why lift the anchor and swim away from this safe harbor. Catch the tail wind with your sails. Use. Dream. Discover. " Global Marine Group is a successful customer focused, full yacht services, including new and used yacht brokerage, surveying, engineering and technical support. Our multi lingual staff has many years’ experience supporting owners, buyers and sellers. 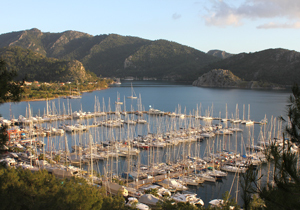 Based in the heart of Turkish yachting and tourism center - Marmaris, together with 24/7 availability services, Global Marine Group offers to all our clients all kinds of high qualified service, from all kinds of technical support, through to total re-fits, to VIP leisure activities arrangement. Our target is to keep our client satisfied with the correct product! In the recent past yachting business has changed radically. Growth in leisure culture and increasing clients` demands have brought about new ways of experiencing services of an yacht agent. In the beginning of 2000`s, in response to these trends, a very new type of a reliable agent became mostly preferred. Global Marine Group has combined the best and high qualified specialists all over the World. Our main prerogatives are - privacy, quick response to all needs and desires of our clients, trust and a high quality of everything we do. Our clients satisfaction and trust have always been the driving force for us. Ships are built to enjoy seas while traveling with comfort competitive with five star hotel … or even better. Our highly professional and multilingual staff offers all kinds of services for our clients to make the idea of owning the ship full of fun and joy. All our efforts are focused on making you happy! If you are just thinking of becoming a new yacht Owner, look through our brokerage list that is constantly updating by our staff. Our team exclusively choose the best yachts for our charter department according to their quality and outfitting simultaneously paying big attention to their crews. In addition to brokerage and charter department our team allows you to do all kinds of refit and technical service, new ships construction, interior design and decoration. If you decide to build your dream we`ll be with you starting from the very beginning of construction process, supervising the construction, final approval, obtaining international certificates, importation, sale and commercial managing, and crew hiring. Global Marine Group has a solid background with our permanent and loyal clients that is not related to yachting. Our experience allows us to offer such sectors as real estate all over the World, business consulting services of our VIP clients, private marina constructions. As Global Marine Group is a fast growing company we are ready to share our success and growth while cooperating with you.